Condoleezza Rice: Clarke: Rice never heard of Al Qaeda before 2000. George W. Bush: Clarke: Bush wants homeland security but did not fund it. George W. Bush: Clarke: Bush admin uses war on terror for political gain. John Ashcroft: Clarke: illusion of security over civil liberties. Donald Rumsfeld: Clarke: Rumsfeld took advantage of 9-11 to push Iraq agenda. Donald Rumsfeld: No decent targets in Afghanistan, so bomb Iraq. George W. Bush: Clarke: Bush insisted on connecting 9-11 with Saddam. George W. Bush: Bush admin knew Iraq not a threat, & had no time for terror. George W. Bush: Clarke: CIA and FBI intelligence failures allowed 9/11. George W. Bush: Clarke: Bush Iraq policy generates Islamic hatred of America. Paul Wolfowitz: Clarke: Wolfowitz disbelieved Al Qaeda�s threat, blamed Iraq. 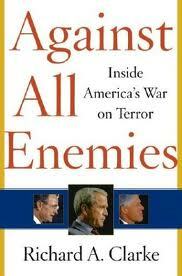 Inside America's War on Terror, by Richard A. Clarke (anti-terror czar from 1992-2002).